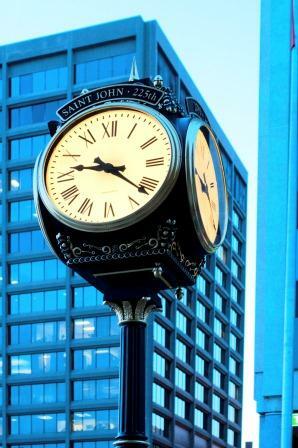 On May 18th, 2010, the City of Saint John celebrated their 225th birthday with the unveiling of a Post Clock, a gift to the city from Commercial Properties. The Post clock is a large 4-dial Howard Clock from Electric Time Company in Medfield, Mass. The clock stands fifteen feet high, and is a replica of a historic piece, however is in fact a high-tech piece that is controlled at the base with a 99B-MI automatic tower clock control with GPS synchronization. 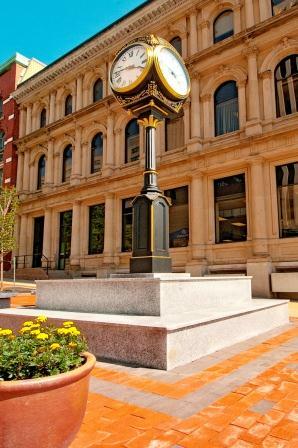 The Post Clock is surrounded by landscaping, granite benches, and pavers.